"60 Years of the Armed Forces of the USSR"
Ribbon of the Jubilee Medal "60 Years of the Armed Forces of the USSR"
The Jubilee Medal "60 Years of the Armed Forces of the USSR" (Russian: Юбилейная медаль «60 лет Вооружённых Сил СССР») was a state military commemorative medal of the Soviet Union established and bestowed to military personnel to denote the sixtieth anniversary of the creation of the armed forces of the Soviet Union. 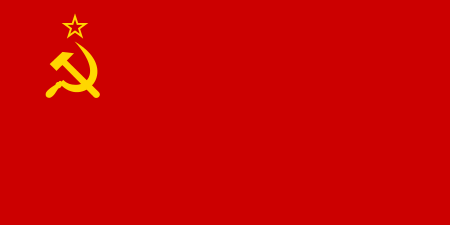 It was established on January 28, 1978 by decree of the Presidium of the Supreme Soviet of the USSR. Its statute was amended by decree of the Presidium of the Supreme Soviet of the USSR on July 18, 1980. The Jubilee Medal "60 Years of the Armed Forces of the USSR" was awarded to officers, warrant officers, sergeants, petty officers, sailors and soldiers, enlisted in the service and on active duty on February 23, 1978 in the Soviet Army, Navy, in the troops of the Ministry of Internal Affairs, in the armed forces of organs of the State Security, in the Council of Ministers of the USSR; to former Red Guards, soldiers who took part in the fighting to protect the Soviet homeland in the Armed Forces of the USSR, to partisans of the Civil War and the Great Patriotic War of 1941–1945; persons discharged from active military service in the reserve or retired, who served in the Soviet Army, Navy, in the troops of the Ministry of Internal Affairs, in the armed forces and organs of the State Security Council of Ministers of the USSR for 20 years or more or that were awarded during their active duty, military orders of the USSR or the medals "For courage", Ushakov, "For Military Merit", "For Distinction in Protection of State Border of the USSR", Nakhimov, "For Distinction in Military Service”. 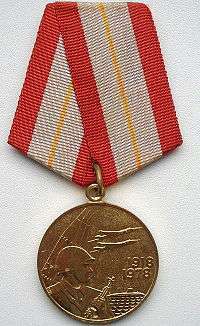 The medal was awarded on behalf of the Presidium of the Supreme Soviet of the USSR by commanders of military units, agencies and institutions. For retirees, by republican, territorial, regional, district, municipal and district military commissariats. Each medal came with an attestation of award, this attestation came in the form of a small 8 cm by 11 cm cardboard booklet bearing the award's name, the recipient's particulars and an official stamp and signature on the inside. The Jubilee Medal "60 Years of the Armed Forces of the USSR" was worn on the left side of the chest and when in the presence of other medals of the USSR, it was located immediately after the Jubilee Medal "50 Years of the Armed Forces of the USSR". If worn in the presence or awards of the Russian Federation, the latter have precedence. Reverse of the Jubilee Medal "60 Years of the Armed Forces of the USSR"
The Jubilee Medal "60 Years of the Armed Forces of the USSR" was a 32mm in diameter brass circular medal with a raised rim on both sides. On its obverse, in the background at left, three rockets pointing skyward toward the upper right, at the upper right, two military jets flying level in formation towards the right, in the forefront at the lower left, the relief image of a helmeted Soviet soldier facing right holding a rifle, to his right on the horizon, the relief image of a surfaced submarine at sea, just above the submarine, at the right, the superimposed dates "1918" and "1978". On the reverse, along the entire circumference of the medal, the circular relief inscription: "Sixty Years" and "Armed Forces of the USSR" (Russian: «Шестьдесят лет» и «Вооружённых Сил СССР»), separated by two small relief five pointed stars. In the center, a five-pointed star with a pebbled finish superimposed on a crossed rifle and sabre, in the star, a hammer and a plough. The medal was secured to a standard Soviet pentagonal mount by a ring through the medal suspension loop. The mount was covered by a 24mm wide grey silk moiré ribbon with 5mm red edge stripes and a central 1mm yellow stripe. 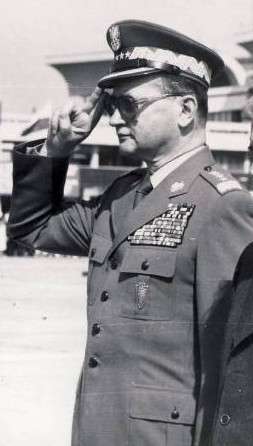 Polish General Wojciech Jaruzelski, a foreign recipient of the Jubilee Medal "60 Years of the Armed Forces of the USSR"
All individuals listed below are recipients of the Jubilee Medal "60 Years of the Armed Forces of the USSR". 1 2 3 4 5 6 "Decree of the Presidium of the Supreme Soviet of the USSR of January 28, 1978" (in Russian). Legal Library of the USSR. 1978-01-28. Retrieved 2012-03-02. 1 2 3 "Decree of the Presidium of the Supreme Soviet of the USSR of July 18, 1980 № 2523-X" (in Russian). Legal Library of the USSR. 1980-07-18. Retrieved 2012-03-02. ↑ "Decree of the President of the Russian Federation of September 7, 2010 No 1099" (in Russian). Russian Gazette. 2010-09-07. Retrieved 2012-03-02.